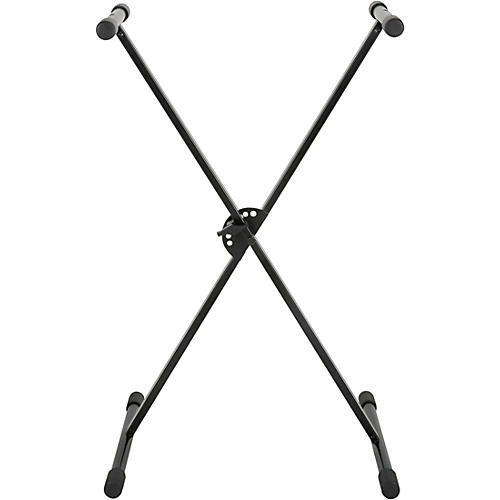 The Musician’s Gear KBX1 Single-Braced Keyboard Stand is the ideal and affordable stand for small and medium-weight keyboards. Its six adjustment settings provide a custom setup for optimal placement, while its spring-loaded handle offers quick, on-the-fly changes. Made with heavy-duty steel construction and non-slip rubber end caps so your instrument stays where you put it. Travel Dimensions (LxW): 38 x 17 in. Keyboard arms (W): 14 in. Foot bars (W): 17 in. 1. 36.5 x 9 in. 2. 34.25 x 15.25 in. 3. 31.5 x 20.25 in. 4. 28.25 x 25 in. 5. 24 x 29 in. 6. 19.5 x 32.5 in.